Because the soil is still warm from the summer, the roots will continue to develop until the first frost. In our area, this occurs around mid-October. However, trees and shrubs will root until the ground freezes. In the spring, these plants will have developed root systems that are actively growing and ready to produce flowers and survive the hot summer months. 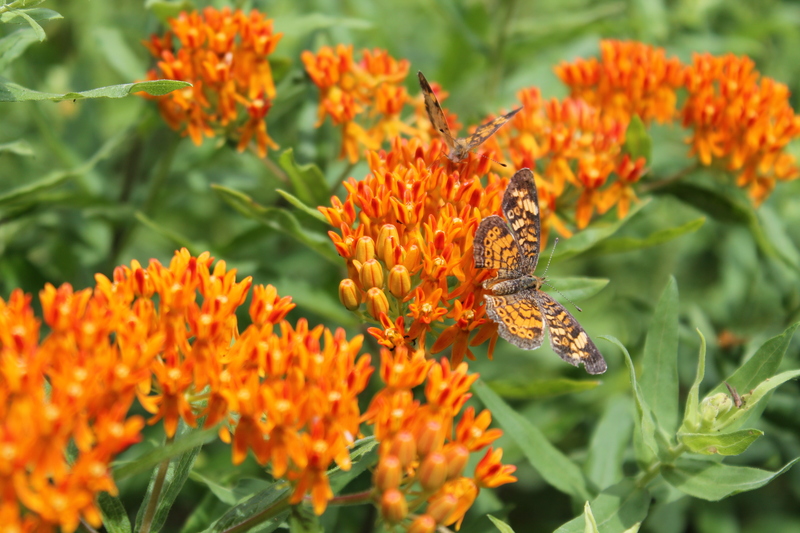 Two years ago, we planted twenty-five butterfly milkweed and twenty-three survived the winter. All of these plants bloomed again this summer. Transplanting causes stress on plants as they are introduced to a new environment. This shock is reduced by planting in the fall because the plant is entering dormancy. The growth is moving from above ground to below ground and root systems are storing energy reserves for next year. Fall transplants have this vital time for root development before winter. Transplanting in the spring, on the other hand, causes additional stress and plants may hardly recover from transplant shock before the demands of summer set in. The overall plant health is improved for next year by starting with transplanting this fall. We have found that when planting in September there are fewer problems with weeds such as crabgrass and foxtail. Transplanting in fall allows plants to get a head start for next season without competing with problematic weeds. Remember to mulch around the plants after the first freeze to help moderate soil temperatures, control winter annual weeds such as henbit, and hold soil moisture through the winter. Keep mulch away from the base of plants to allow proper air exchange. Pale coneflowers blooming the next spring after planting. All those pesky bugs are less active in the fall. They are not nibbling or sipping on your plants. With their life cycles nearly complete, they are looking for homes to survive the winter. Fewer bugs means less-stressed plants that will have a chance to get properly rooted. Warm days and cool nights provide an ideal environment for transplanting and growth. Typically, fall brings many cool, cloudy days with frequent precipitation. Warm sunny days can cause stress on new transplants. Cooler nights and morning dew allow plants to recover each night. Beneficial autumn rains will eliminate some daily watering. Here at the Arboretum, we prefer to plant in the fall because we have more time and have seen the benefits first hand. We are usually very busy in the spring readying the gardens. It is nice to see plants that were started in the fall jumping to life and even blooming that next year. As an encouragement to plant trees this fall, bring this TREE COUPON to the sale to receive an additional discount. Whenever you plant, whether spring or fall, the ultimate goal is to create a landscape you can enjoy. 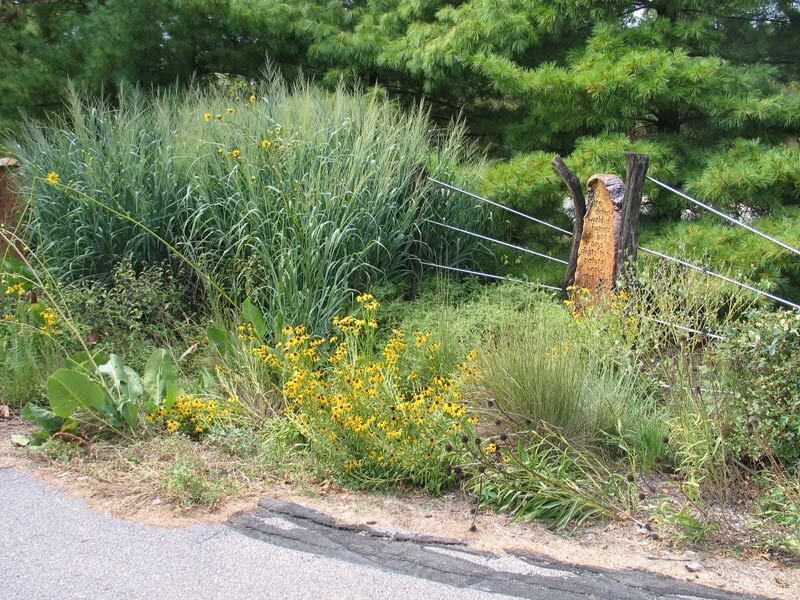 If you need some ideas to get you started, check out these sample landscape designs and our 2016 Native Plant Guide. Gayfeathers are truly iconic symbols of the prairie. 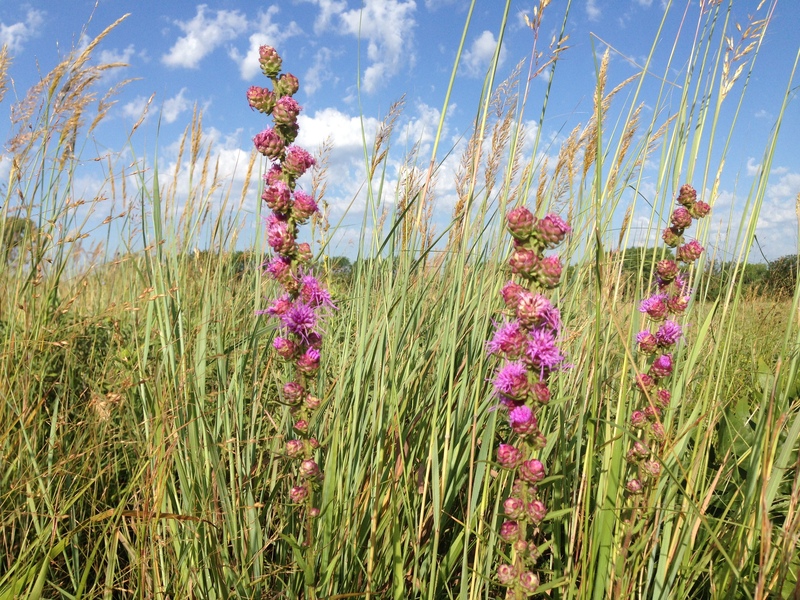 Also known as blazing stars, these distinctive plants occur throughout Kansas grasslands. 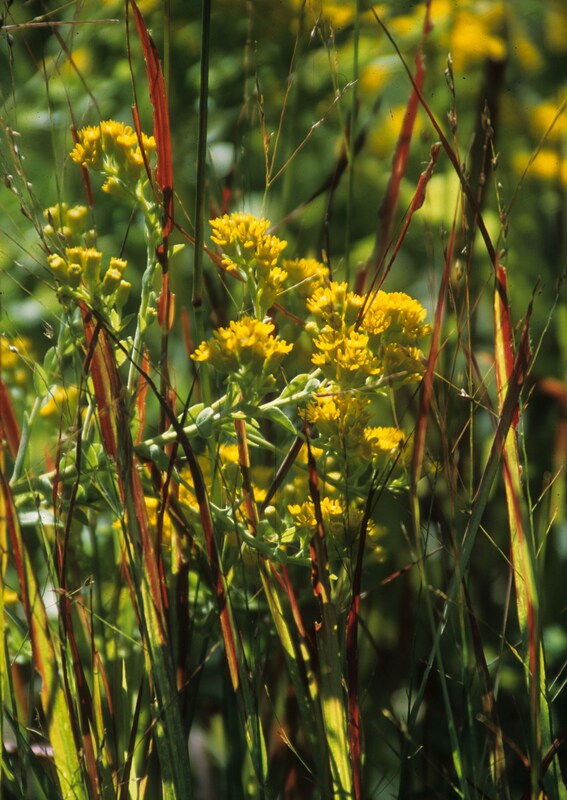 Seven species are native to our state, all blooming during late summer and early fall. 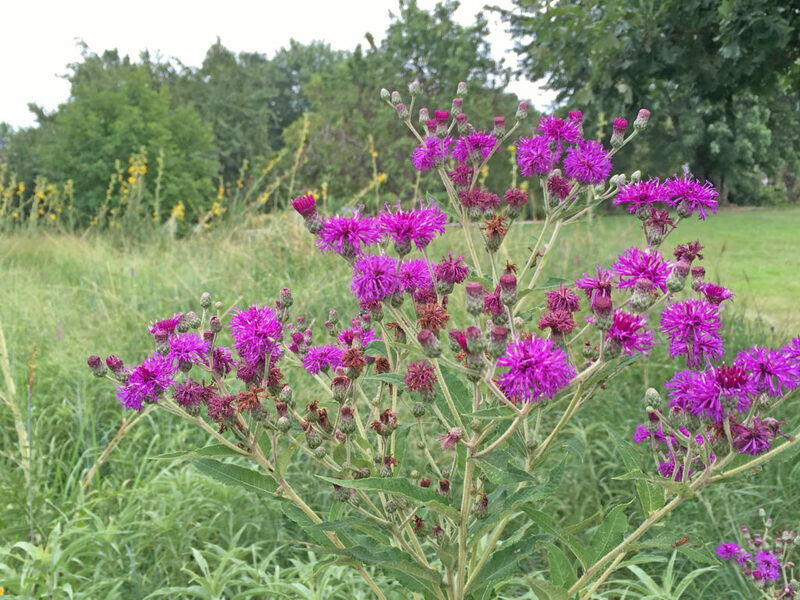 Producing upright spikes crowded with rose-purple flower heads, gayfeathers add a distinctive dimension to late-season landscapes dominated by asters, sunflowers, and goldenrods. Four species of gayfeathers can be found in the Arboretum’s living collections. 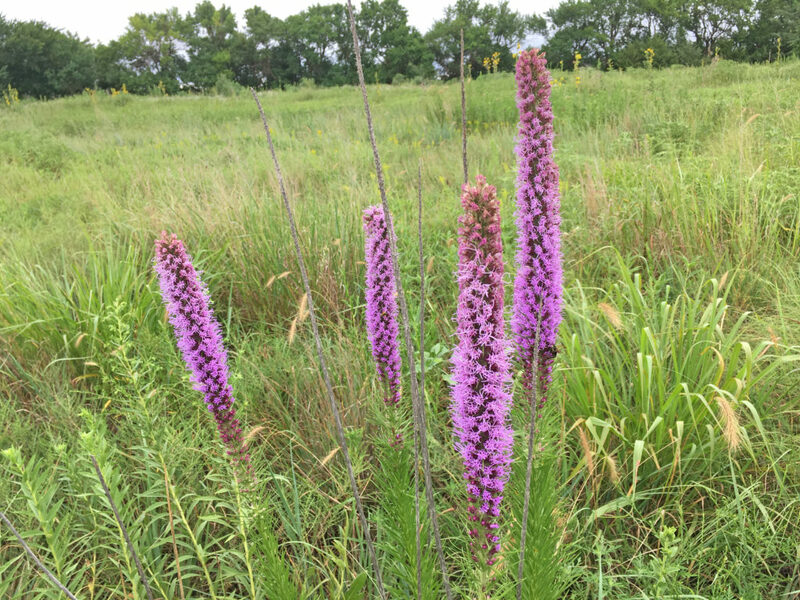 Kansas gayfeather or thickspike gayfeather (Liatris pycnostachya) is the tallest, reaching up to five feet in height. 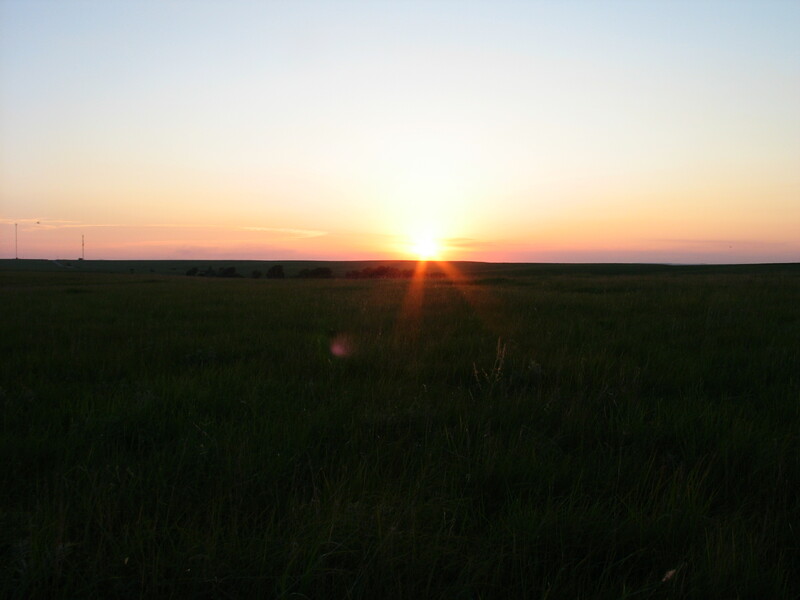 It is a plant of the tallgrass prairie of eastern Kansas. 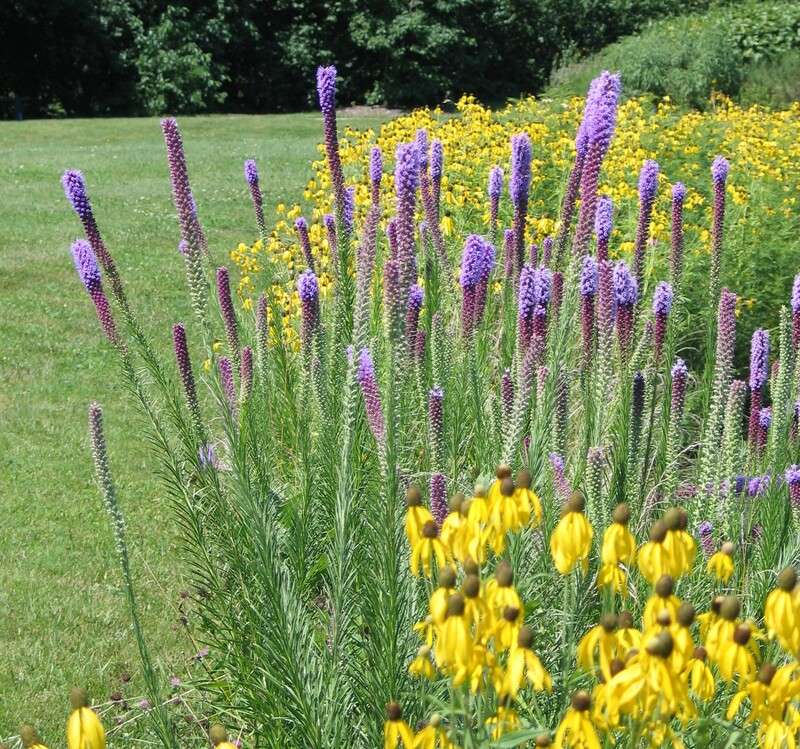 Button blazing star or rough gayfeather (L. aspera) occurs in drier habitats and is generally about three feet tall. 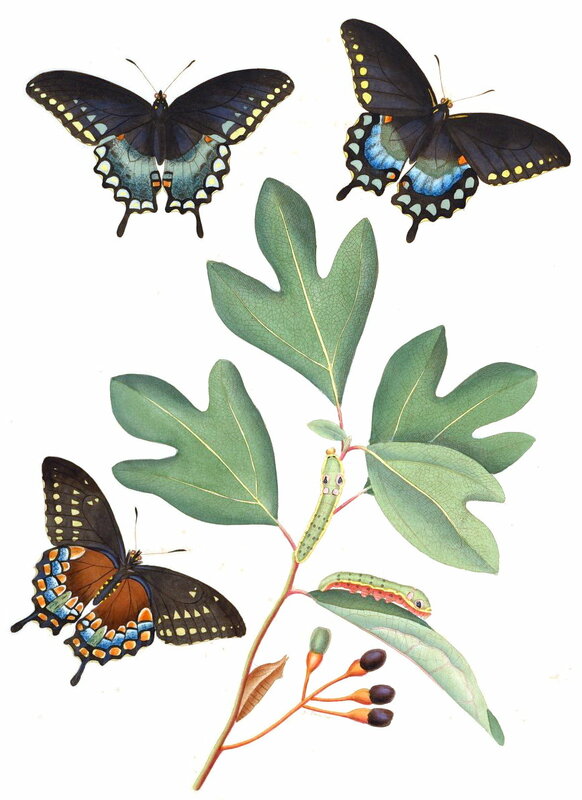 Two other species, L. mucronata and L. punctata grow from one to three feet in height. 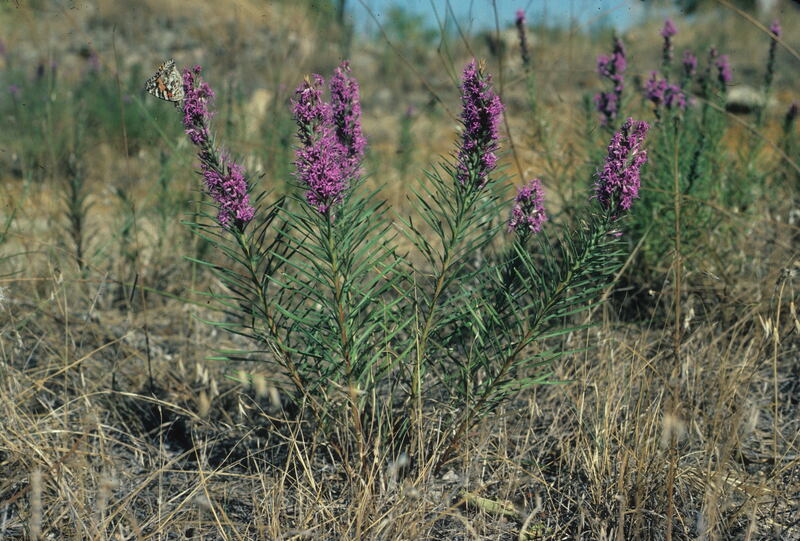 Liatris punctata occurs throughout the state and is the most drought tolerant of the gayfeathers. Gayfeathers are not only beautiful in their natural settings, they also make very fine garden plants. Thickspike is the species most likely to be sold by nurseries and garden centers. We will have most of these species at our FloraKansas Plant Sale. They all appreciate a sunny flower bed or border. 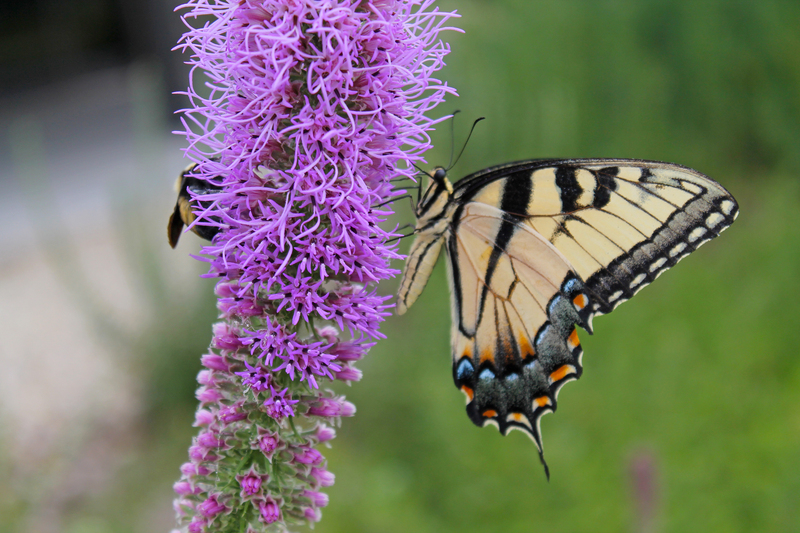 Adding to their value as garden plants, gayfeathers are also attractive to many butterflies and other pollinators. In addition, the spikes make excellent cut flowers, either fresh or dried. At last year’s fall plant sale I convinced my father to plant some oak trees around his house where older shade trees are nearing the end of their lives. I told him to think ahead ten years: when the sweetgum (Liquidambar styraciflua) in the front yard finally dies, won’t he wish that he had a head start on growing the next shade tree nearby? And wouldn’t it be nice to start a row of trees near his workshop to block the hot west sun? Of course! He ended up choosing a few Shumard oaks (Quercus shumardii) which have done well for him and are off to a great start. These trees were an investment in the future of his property ownership – well placed trees can save you money on heating and cooling your home and offer protection to your roof and siding from the sun’s damaging rays. Are there parts of your yard that need a shade tree? Or perhaps you have a tree that will need replacing in the near future? Do your research and find the perfect tree for your needs, practical and aesthetic. Following are some of my favorites from the upcoming sale, but a full list is available here. If you want to add a fruiting tree to your landscape, consider a Kansas native. PawPaw (Asimina triloba) and Persimmons (Diospyros virginiana) are both delicious and underused native fruits. Both are small to medium sized trees when mature (20 to 40 feet tall) and grow well in moist to medium-dry environments. Persimmon (left) and PawPaw (right) both produce delicious fruit. If you already have some large shade trees and want to add canopy layers, consider an under story tree that thrives in the dappled sunlight and protection of larger trees nearby. Sassafras trees (Sassafras albidium) have unique foliage, showy spring flowers and all parts of the plant have a pleasant smell. Eastern Wahoo (Euonymous atropurpureus) is known for it’s intense fall color and often grows in a shrubby form. There are lots of showy flowering trees to choose from, but we carry a few particularly unique options. Hop hornbeam (Ostrya virginiana) has cream colored shrimp shaped flowers, seen below. Yellowwood (Cladrastis kentukea) trees have pendulous white blooms and bright golden fall color. 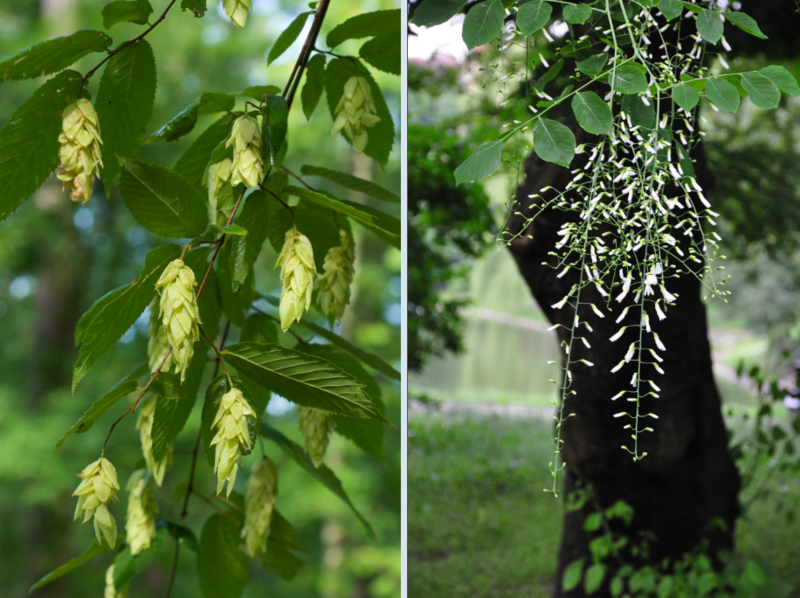 Blooms of hop hornbeam and yellowwood trees. Big sturdy shade trees are a good choice for a homeowner looking to reduce their electricity bills and protect their home from the elements. Black oak (Quercus velutina) and American Chestnut (Castenea dentata) both grow upwards of 60 feet tall and both produce nuts that provide winter food for wildlife. Planting a tree is a satisfying task — it is an investment in the years to come, the hope of growth and newness. A mature tree can even raise the market value of your home! Tree coupons for the fall plant sale (September 9 – 11) will be available soon on our website. Hope to see you at our upcoming sale, carting away a tree of your own. I have said it before that fall is my favorite time of the year. It means that the hottest days of summer will be replaced by autumn’s cool mornings and warm afternoons. The landscape is transformed by subtle, incremental changes that are unique every year. I have seen hints that these shifts are already happening, which is exciting. As a gardener, I gain a deeper appreciation of autumn’s exquisite beauty each year. Fall should be the crescendo of your garden. The culmination of your time and effort with every element fitting harmoniously together. So how do you set the stage to make a grand statement with your landscape in the fall? Here some essential elements that I consider as I design a garden, especially if you want to create a show later in the season. 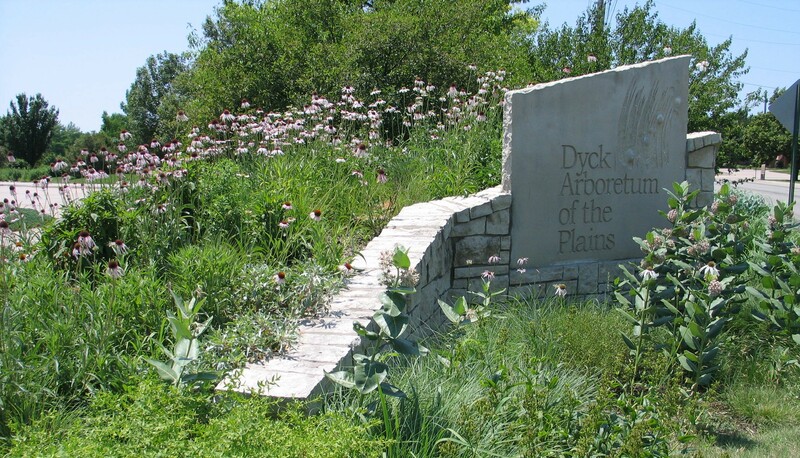 When you look at a prairie in the fall, native grasses dominate the landscape. They are in full bloom with interesting seedheads and colorful stems. Grasses provide texture and movement in the garden, plus they are extremely hardy. They move with the gentlest breeze and rustle as the north wind ushers in cooler weather. I like to use grasses as backdrops for other perennials. The dark brown coneflower seedheads really stand out in the slender red stems of little bluestem. The red leaves of Penstemon ‘Dark Towers’ look great with Panicum ‘Northwind’ switchgrass. Mix and match grasses with perennials both tall and short. You really can’t go wrong by taking advantage of different types of leaves and including native grasses in your design. Layering plants is the best way to mimic nature. It is critical to have the canopy of trees stair stepped down to understory trees and shrubs extended outward with native wildflowers and grasses. Each of these layers can have a diverse selection of plant material that adds form, structure, and beautiful fall colors. Everything that wildlife needs for survival can be included in these layers as well. Place maples and oaks in the back with dogwoods, viburnums, serviceberries and crabapples in the middle layer, and a host of wildflowers, grasses, and shorter shrubs such as sumac spreading into the sunlight away from the shadow of the trees. I develop eye-catching lines and curves either through the use of plants or edging. Curves can lead you through the garden or take you gently around a corner to reveal a piece of art or focal point. Rather than straight lines, try undulating your borders. It gives the illusion of extra space while drawing your eye along the border. 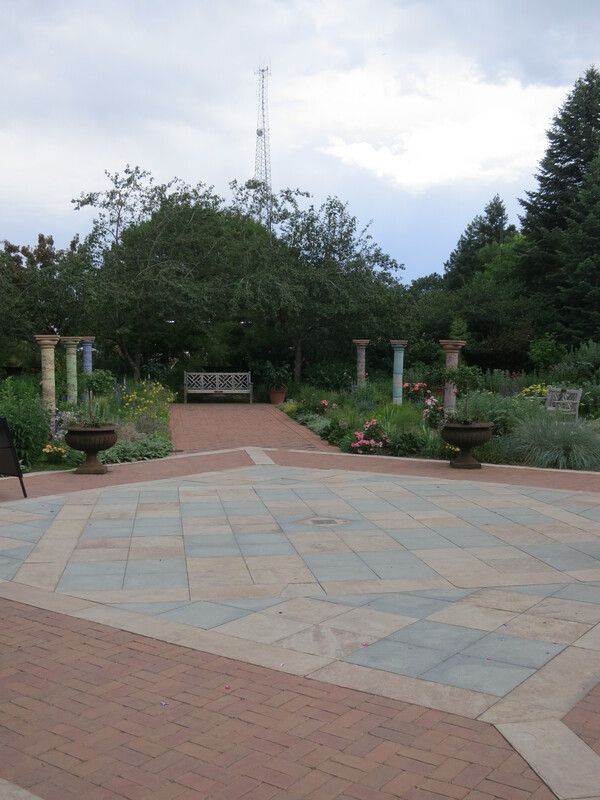 Also, curves relieve the linearity of most gardens. 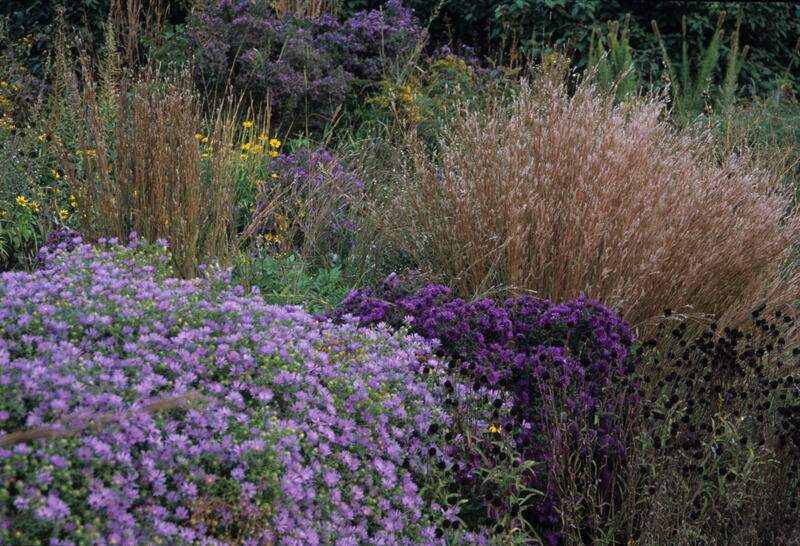 I use ‘October Skies’ aromatic aster or shorter grasses such as Bouteloua ‘Blonde Ambition’ or prairie dropseed along these borders for dramatic effect. You can enjoy a colorful fall garden through leaf color or blooms. Maple trees like ‘John Pair’ or ‘Autumn Splendor’ develop beautiful fall color. I love the blooms of Asters and goldenrods late in the season. They extend the blooms well into September and October. 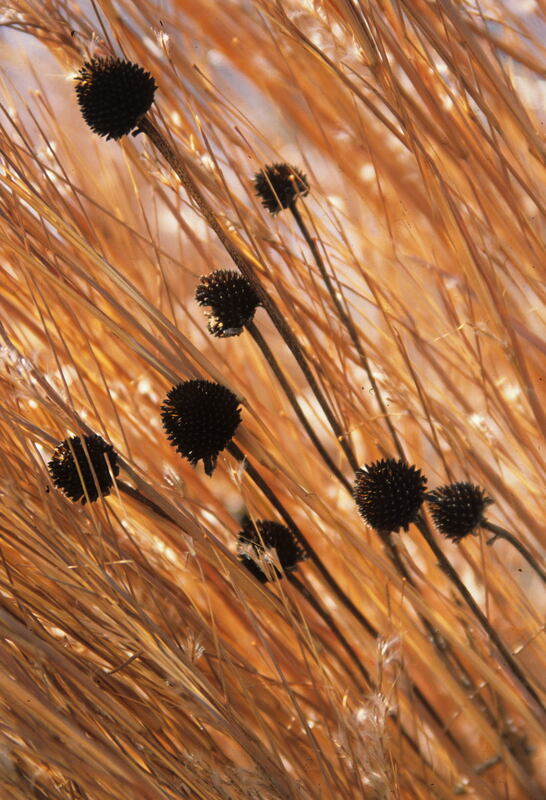 Native grasses are transformed from green to splendid shades of reds, oranges, and yellows. Amsonia hubrichtii turns butter yellow and a large mass of them is quite stunning. This is one of my favorite plants because it has multiple seasons of interest. Amsonia hubrichtii Photo courtesy Walters Gardens. The lower angle of the autumn sun can transform a garden. Take advantage of its glow with bright fall colors and interesting forms. The late evening light illuminates native grasses in exquisite ways. 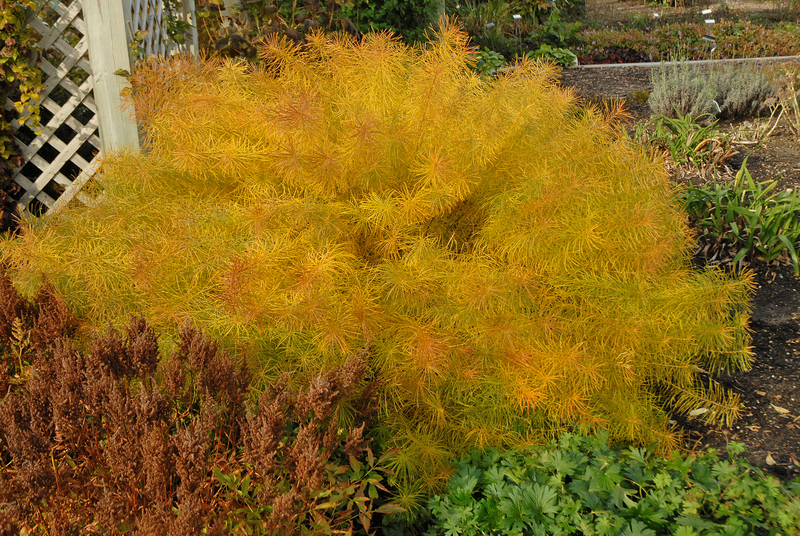 ‘Tiger Eyes’ sumac with its chartreuse foliage that changes to oranges and yellows as the season progresses can brighten up a dark corner of your garden. Look for areas in your garden worth highlighting such as an arbor, a bench or a piece of art. You can leave a narrow swath of lawn with perennials and shrubs on either side that lead to this focal point. Interesting lines and diverse plants will only add to the intrigue and beauty of this space. It is another trick you can use to draw people into the garden. In fact, all these elements will draw you into the garden this fall. They will help you transform your landscape into a beautiful and functional space. By thinking about or adding just of few of these elements, you will be rewarded as your garden transitions from summer to fall. Late July to early August is a great time of the year to be celebrating Silphiums. 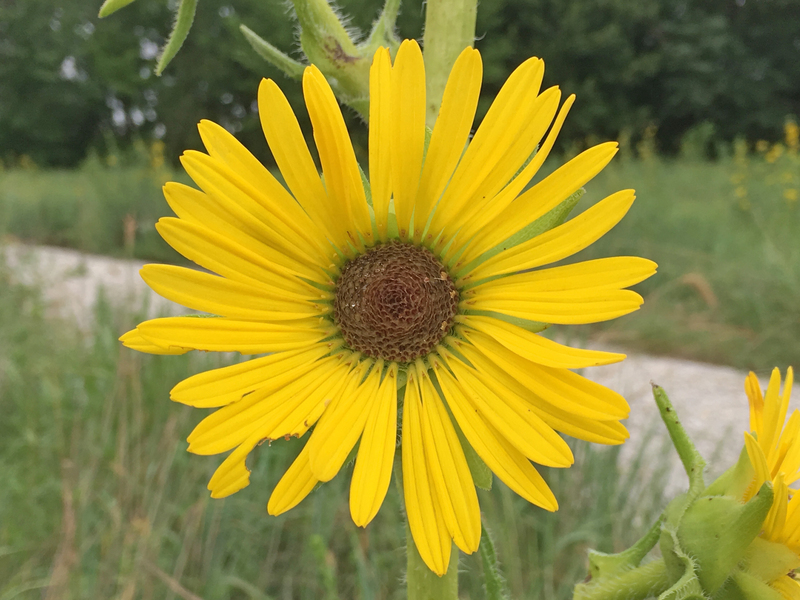 Scott wrote a Silphium post last summer highlighting the four species we can grow well in south central Kansas. I noticed during a recent walk around the Arboretum how brilliantly all four of these species are flowering right now and felt that they were worth recognizing once again. Review Scott’s post at the link above to become familiar with the four species we have in the Arboretum. I’ll touch on a few additional features of this genus in more depth. 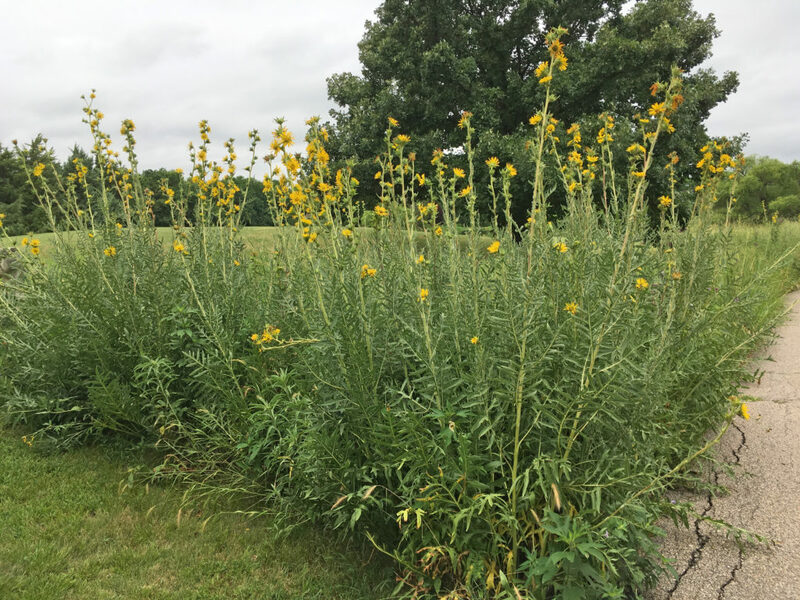 Compass plant gets its name because the leaves tend to orient north and south and take advantage of cooler morning and evening sunlight to photosynthesize. 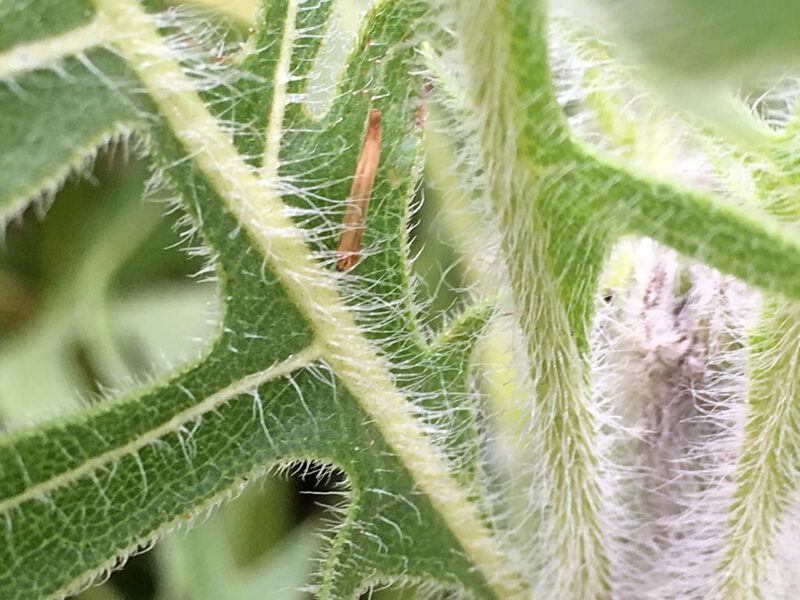 When the sun is directly overhead during hotter times of the day, compass plant leaves have less direct sun exposure to minimize heat buildup and moisture loss. Cup plant does the same thing. Go HERE for an article in the American Journal of Botany for more on this topic. Leaf morphology (or shape and form) plays its part too. Deeply lobed compass plant leaves have greater surface area than cup plant, which may translate to a more efficient heat radiating capacity (think of the function of a car radiator with all its coils and fins to maximize cooling potential). Of the four species that Scott highlights, cup plant is the only Silphium species that doesn’t have a native range in Kansas (even though it seems to grow well here). Its range is east and north of Kansas where average precipitation levels are higher and temperatures are lower. 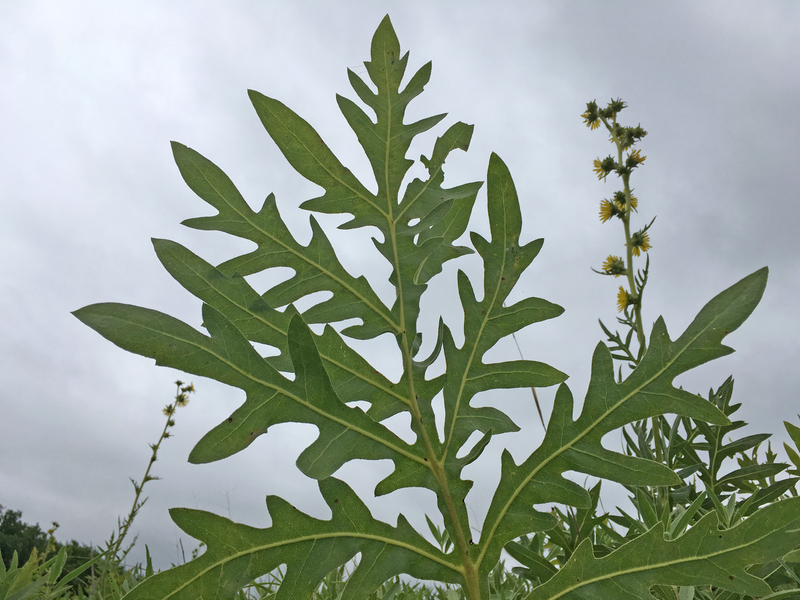 Compass plant extends into drier and warmer climates and so this difference in leaf morphology between the two species may be a plausible adaptation for dealing with climate variation. 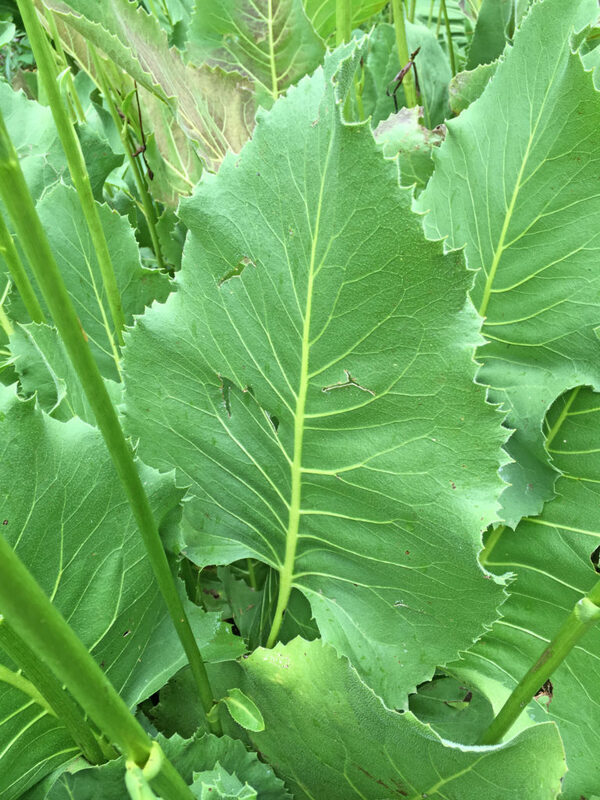 Dense white hairs on Silphium leaves also help reflect sunlight and reduce wind speeds at the leaf surface. Both can reduce moisture loss. Even though Silphiums are in the sunflower family (Asteraceae), they differ physiologically in their seed formation. You probably know that typical sunflower family flowering heads have both disc and ray florets. The ray florets act as sterile pollinator attractors and the disc florets are the seed producers. Our state flower, annual sunflower (Helianthus annuus), is one good example. Silphiums are just the opposite in that the attractive ray florets are the seed producers. Botany geeks are fascinated by these kinds of things, but I’m sure the more casual observer will find this equally as riveting. When it comes to growing native plants in your landscape, few are easier to establish than Silphiums. That’s the positive way to look at it. 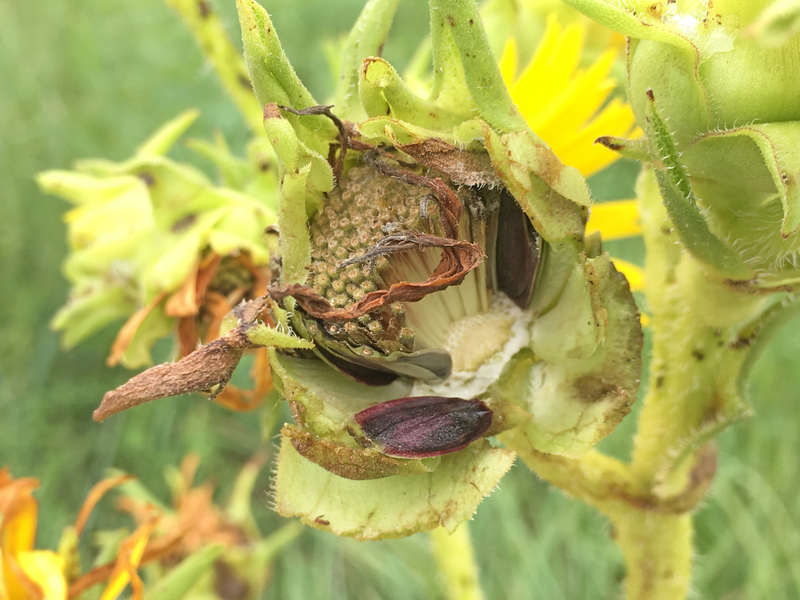 If you ask anybody who has had experience growing Silphiums as an ornamental in their manicured landscape, they will probably cite that they are invasive and problematic. Some use more pointed, even colorful language. You won’t notice this for the first few years while they are establishing. But when they start flowering in year four or five and seeds start dropping, that is when the invasion begins. Because each Silphium plant grows to a sizeable diameter of three feet or more, and the plants grow to a substantial height, they can become downright bullies. So, we still encourage people to enjoy Silphiums for all the apparent reasons…colorful flowers during the heat of the summer, interesting foliage, and a great attractor of all sorts of insects via flowers and vegetation. But plant them in an area such as a prairie restoration or a less ornamental landscaped area where you won’t be as concerned with its aggressiveness or be judicious with deadheading. Keep scale in mind too with regard to the 6-9 feet height of Silphiums and the size of your planting area, as taller plants fit better in bigger planting areas. Compass plant has spread and come to dominate this 15 year-old planted bed. 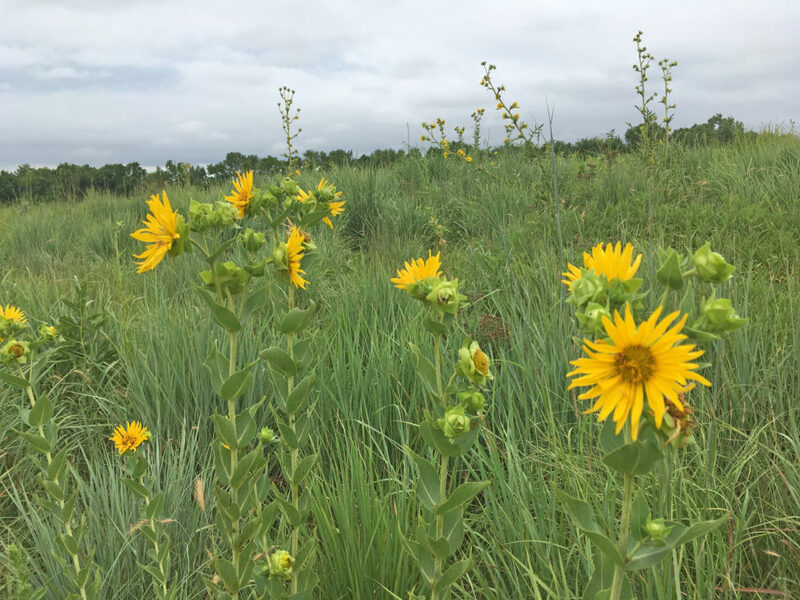 Rosinweed in the foreground and compass plant in the back seem to thus far be balanced in a diversely-planted and highly competitive five year-old reconstructed prairie environment. Finally, if you have identified the appropriate area and decide to add Silphiums to your landscape, you might as well add some complementary purple flowers like ironweed and gayfeather. 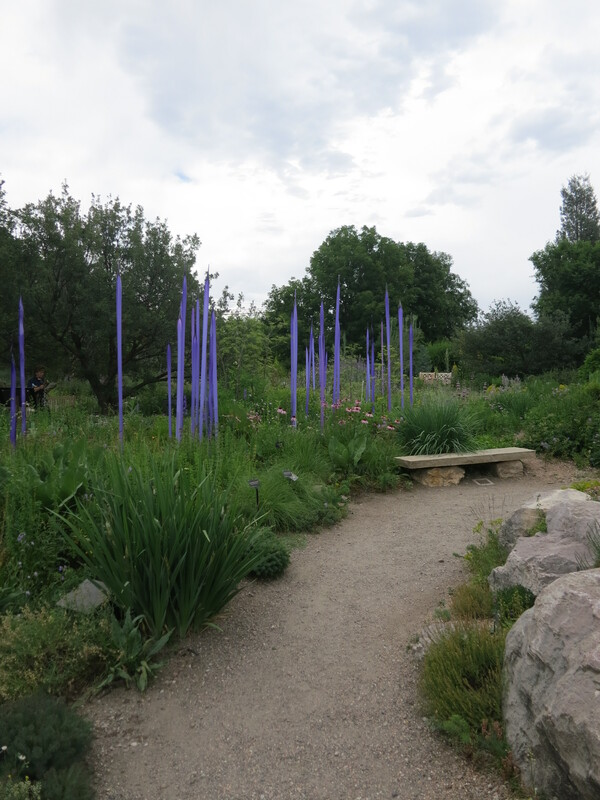 They bloom at the same time and add visual enjoyment and pollinator sources. These species along with Silphiums will add great interest to your landscape.